Lancaster County has a new attraction which celebrates one of our biggest industries, Dairy! The “Turkey Hill Experience” is an interactive, Disney-style attraction that’s fantastic addition to your vacation itinerary. Just a few of the exhibits include milking a mechanical cow, walking through a freezer and taking an ‘ice tea personality test’! 26,000 square feet of exhibits, dining areas and retail space. Nine interactive exhibit areas will allow visitors to learn more about dairy culture, the story of Turkey Hill Dairy, and how the company’s top-selling ice cream and iced tea flavors are selected and created. Exhibits will also feature Lancaster County cultural highlights, including some history of the lower Susquehanna River Valley and the rural farming area surrounding Turkey Hill Dairy. Visitors will truly experience what it’s like to be a Turkey Hill Dairy ice cream maker for a day, including the opportunity to create his or her own ice cream flavor. An entrance fee will be charged to visit the main interactive exhibit area, but a portion of the exhibits will be open to the public at no charge. 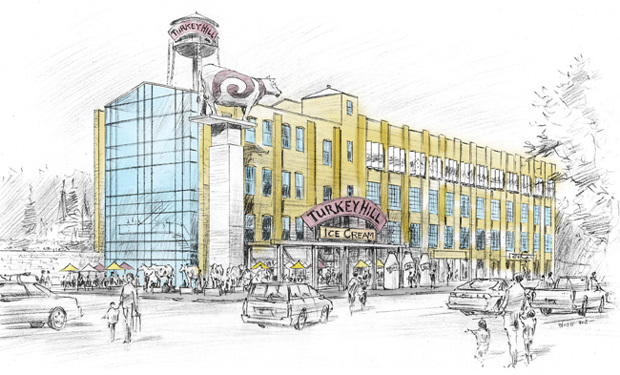 The first floor of the Turkey Hill Experience will feature a large creamery, which will serve the general community.